The massive plume of mine waste that was accidentally released into the Animas River last week appears to have moved downstream. Dr. Larry Wolk, Colorado’s top health official, says that the formerly-orange water “doesn’t appear” to be dangerous. The river remains closed, but these initial findings could be a sign that it will reopen soon. The spill occurred on August 5 while contractors from the Environmental Protection Agency (EPA) were assessing the Gold King mine. The EPA accidentally shook loose a debris damn and nearly three million gallons of water—enough to fill three Olympic swimming pools—laced with arsenic, lead, zinc, and other toxins spilled into the Animas River. The sludge has since flowed downstream into New Mexico where it has entered the San Juan River. While the waste has moved on from the Animas and the preliminary tests are positive, this does not mean the communities living along it are in the clear just yet. Heavy metals tend to stick around and exposure doesn’t cause noticeable health effects immediately. 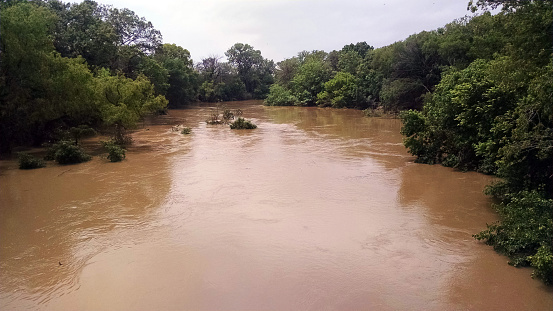 There is concern that deposits have formed in the river’s sediment. These stores would not be reflected in water tests, but could be kicked up and re-enter the river at any time. There are over 400 mines in the Silverton area, near where the spill began, many of which occasionally leak toxins into rivers and streams. Although the EPA has been trying to get the area declared a Superfund site—which would trigger federal funds for intensive cleanup efforts—locals have long blocked the move over publicity and tourism concerns. Instead, the EPA has been working with the Animas River Stakeholder Group to clean up mines in the region one-by-one, but from the beginning these efforts were considered uncertain. Mine discharge has a habit of backing up and flowing elsewhere when one exit is plugged. Ford, D., et al., “Colorado health official: No river health risk,” CNN web site, August 11, 2015; http://www.cnn.com/2015/08/10/us/epa-river-spill-residents/index.html. Plumer, B., “How the EPA managed to spill 3 million gallons of mining waste into a Colorado river,” Vox web site, August 10, 2015; http://www.vox.com/2015/8/10/9126853/epa-mine-spill-animas.